Our cottages are fully equipped, free-standing, self-catering cottages with free Wi-Fi, color cable TV, private bath and AC/Heat. Linens and cooking utensils are provided. Fresh towels and supplies available daily. Complimentary light housekeeping available mid-stay for stays of 7 or more days. Arrangements for daily light housekeeping for a nominal daily fee may be requested in advance. 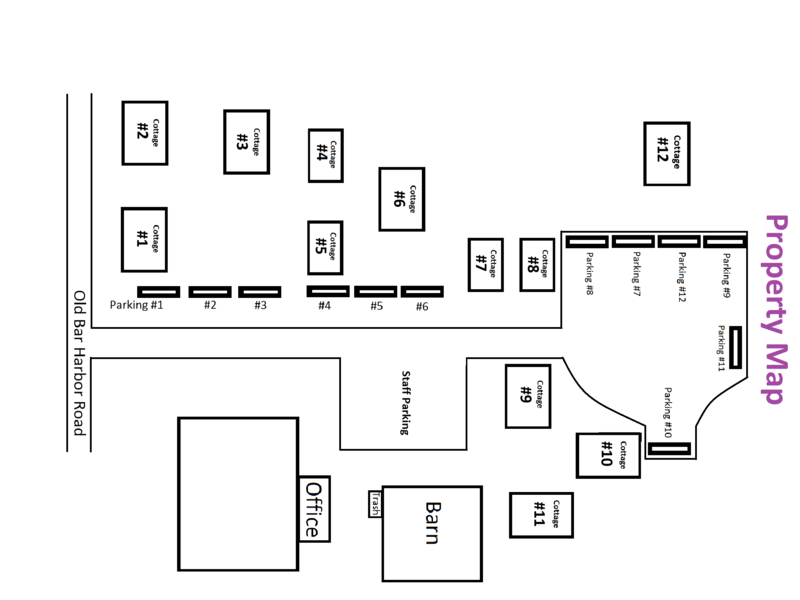 To view a map of the property, please click here. To view our up-to-the-minute availability and rates, please click on the green "Check Availability" button at the top of every page or, for mobile users, click on the "Book" link at the top of the home page. 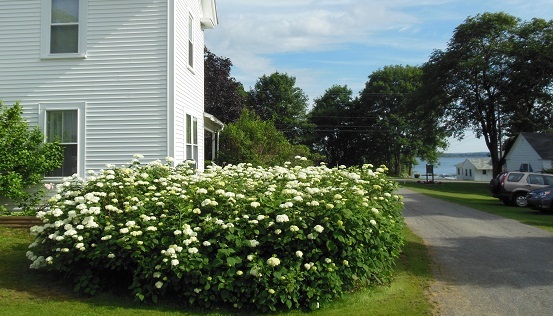 Guest Cottage #1 is a two bedroom cottage with a partial water view that can accommodate up to 5 people. It has one queen bed, a full size bed and a pull-out couch twin bed. The eat-in kitchenette with table and chairs includes a half-sized refrigerator, a two-burner stove top, microwave oven, toaster oven, and coffee maker. It has one bathroom with a shower and includes a screened-in porch with seating and an outdoor picnic table. Guest Cottage #2 is a two bedroom cottage with a partial water view that can accommodate up to 5 people. It has two queen beds and a pull-out couch twin bed. The eat-in kitchenette with table and chairs includes a half-sized refrigerator, a two-burner stove top, microwave oven, toaster oven, and coffee maker. It has one bathroom with a shower and includes a screened-in porch with seating and an outdoor picnic table. Guest Cottage #3 is a one bedroom cottage with a garden view that can accommodate up to 4 people. It has two separate sleeping areas with one queen bed and one full-sized bed. The kitchenette includes a half-sized refrigerator, a two-burner stove top, microwave oven, toaster oven, and coffee maker. It has one bathroom with a shower and includes a screened-in porch with seating and an outdoor picnic table. Guest Cottage #4 is a studio cottage with a garden view that can accommodate up to 2 people. It has one queen bed. The eat-in kitchenette with table and chairs includes a half-sized refrigerator, a two-burner stove top, microwave oven, toaster oven, and coffee maker. It has one bathroom with a shower and includes a screened-in porch with seating and an outdoor picnic table. Guest Cottage #5 is a studio cottage with a garden view that can accommodate up to 2 people. It has one queen bed and a kitchenette with a half-size refrigerator, a two-burner stove top, microwave oven, toaster oven, and coffee maker. It has one bathroom with a shower and includes a screened-in porch with seating and an outdoor picnic table. Guest Cottage #6 is a one bedroom cottage with a garden view that can accommodate up to 4 people. It has two separate sleeping areas with a queen bed and two twin beds. The eat-in kitchenette with table and chairs includes a half-sized refrigerator, a two-burner stove top, microwave oven, toaster oven, and coffee maker. 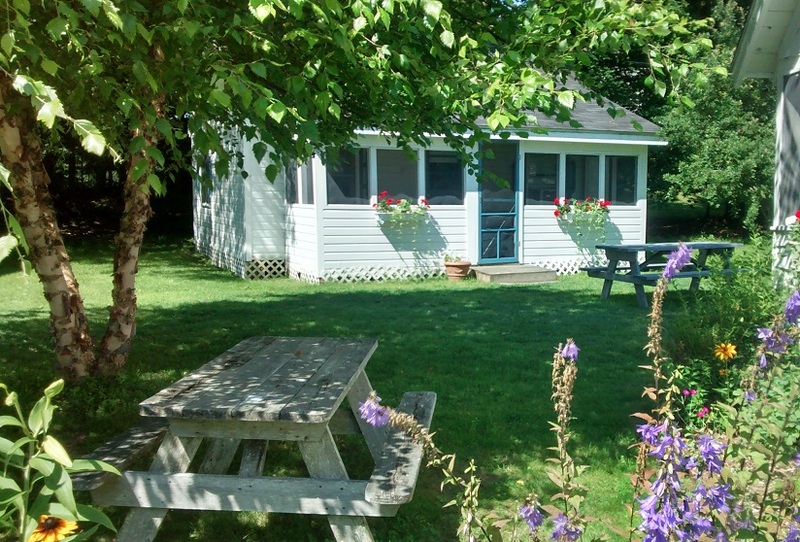 It has one bathroom with a shower and includes a screened-in porch with seating and an outdoor picnic table. 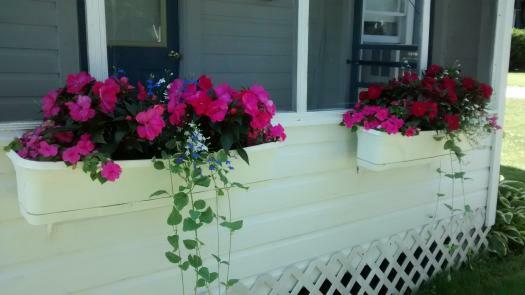 Guest Cottage #7 is a studio cottage with a garden view that can accommodate up to 2 people. It has one queen bed. The eat-in kitchenette with table and chairs includes a half-sized refrigerator, a two-burner stove top, microwave oven, toaster oven, and coffee maker. It has one bathroom with a shower and includes a screened-in porch with seating and an outdoor picnic table. Guest Cottage #8 is a studio cottage with a garden view that can accommodate up to 2 people. It has one queen bed. The eat-in kitchenette with table and chairs includes a half-sized refrigerator, a two-burner stove top, microwave oven, toaster oven, and coffee maker. It has one bathroom with a shower and includes a screened-in porch with seating and an outdoor picnic table. For a special treat, consider a newly renovated and redecorated Victorian Cottage Suite #9 with a partial water view, AC/Heat, color cable TV, separate bedroom with queen size bed, a private bathroom with shower, a living area with sleeper sofa, antique wicker furniture, a free standing gas fireplace, a kitchenette and a dining alcove with French doors leading to a screened porch. Victorian Cottage can accommodate up to two people. The eat-in kitchenette with table and chairs includes a half-sized refrigerator, a two-burner stove top, microwave oven, toaster oven, and coffee maker. 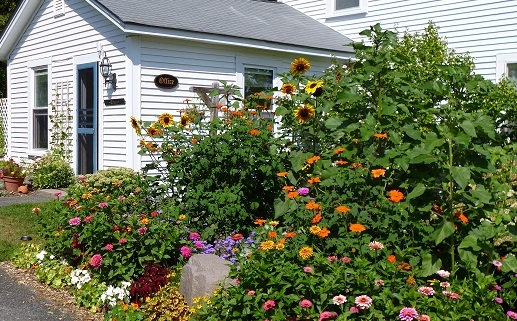 Guest Cottage #10 is a two bedroom cottage with a garden view that can accommodate up to 6 people. It has two queen beds and a pull-out couch full size bed. The eat-in kitchenette with table and chairs includes a half-sized refrigerator, a two-burner stove top, microwave oven, toaster oven, and coffee maker. It has one bathroom with a shower and includes a screened-in porch with seating and an outdoor picnic table. 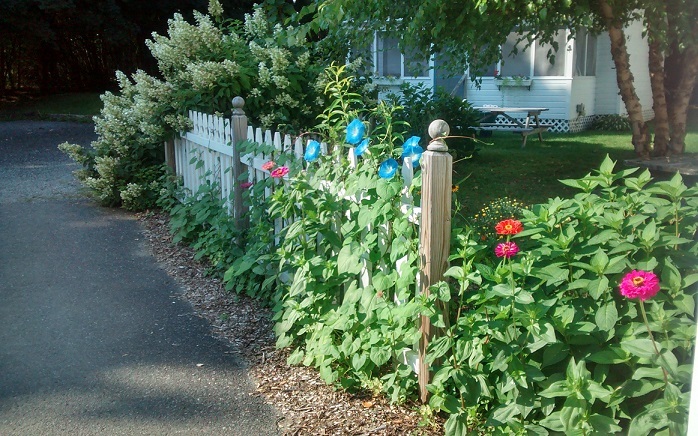 Guest Cottage #11 is a two bedroom cottage with a garden view that can accommodate up to 6 people. It has two queen beds and a pull-out couch full size bed. The eat-in kitchenette with table and chairs includes a half-sized refrigerator, a two-burner stove top, microwave oven, toaster oven, and coffee maker. It has one bathroom with a shower and includes a screened-in porch with seating and an outdoor picnic table. Guest Cottage #12 is a two bedroom cottage with a garden view that can accommodate up to 6 people. It has two queen beds and a pull-out couch full sized bed. The eat-in kitchenette with table and chairs includes a half-sized refrigerator, a two-burner stove top, microwave oven, toaster oven, and coffee maker. It has one bathroom with a shower. Includes a sitting area outside instead of screened-in porch. For a special treat, consider the Victorian Cottage Suite, which is a free-standing cottage with a partial water view, AC/Heat, color cable TV, separate bedroom with queen size bed, a private bath, a living area with sleeper sofa, antique wicker furniture, a free-standing gas fireplace, a kitchenette and a dining alcove with French doors leading to a screened porch. 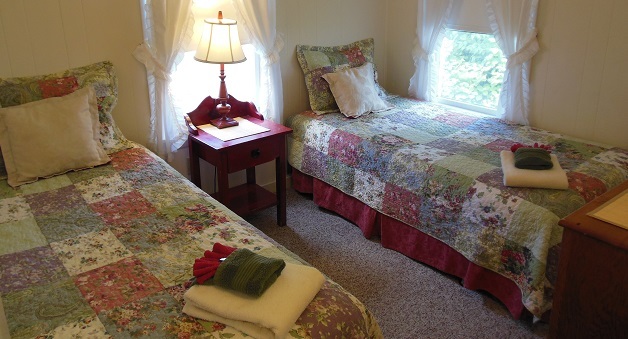 Our cottages are comfortable and stylish. Our studio, one and two bedroom, fully equipped self-catering cottages can comfortably accommodate 1-6 people and have kitchenettes, cable color TV, private bath, AC/Heat and most have screened porches. Linens and cooking utensils are provided. Fresh towels and supplies available daily. 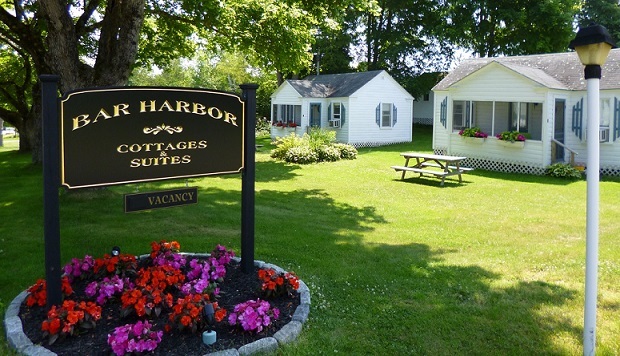 © 2019 Bar Harbor Cottages & Suites. All rights reserved.